One of the world’s greatest ever footballers, Cristiano Ronaldo, rose to further prominence after a breathtaking performance in the UEFA Champions League quarter-final first-leg tie against Juventus in Turin. Ronaldo reached the 14-goal mark of the ongoing Champions League campaign after a stunning brace against the Italian champions. The player, who ruined Juventus’ night in Cardiff last year in the final of the UCL, was once again the mastermind of their fall, as Real won 3-0 on the night. His brilliantly taken overhead kick not only had the entire stadium and fans across the globe rising in appreciation, but his manager, Zinedine Zidane, was also left pricelessly stunned. Ronaldo’s bicycle kick was straight up as he reached the ball, and then it went straight in with a lot of power and pace, leaving Gianluigi Buffon with no chance of even reacting to the same. And this moment had Zidane in utter disbelief. The two-time Champions League winning manager turned towards the bench with his hands on his head, with a look of shock on his face. The clip of the Frenchman’s reaction went viral on social media site Twitter, as fans felt he too, reacted in the way most people would have after witnessing that gem of a strike. 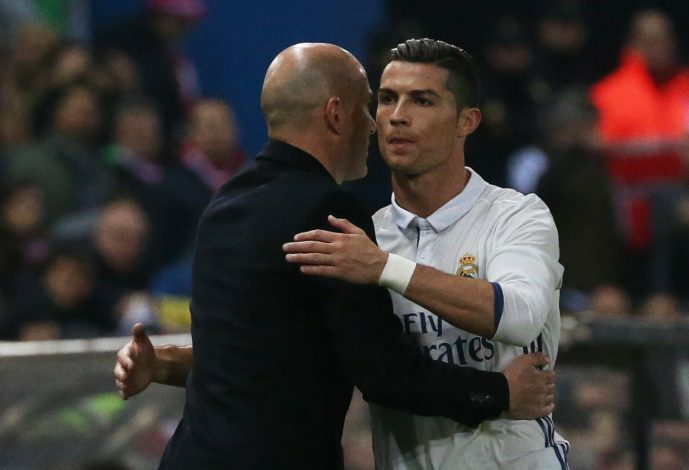 Zidane, who in his time has scored some epic goals too, will be ecstatic to see his team’s main man deliver a performance like that.